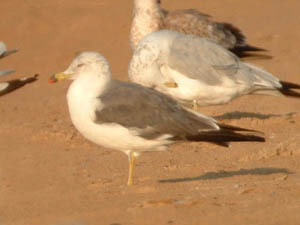 Early on the morning of August 7, 2003, Chicago birder Mike Miller was scanning Montrose Beach and noticed an odd dark gull among the local Ring-billed Gulls that had gathered at the west end of the beach. I was standing next to Mike and when I heard him utter the words "There's a darker backed gull over here" I swung my telescope around to where he was looking and almost immediately saw what looked like an adult Lesser Black-backed Gull. In the back of my mind however I knew this could be the coveted Black-tailed Gull that had been seen as recently as the day before at Miller Beach in Indiana, and several months earlier along the southern Wisconsin lakefront. We were too far away to see the diagnostic red tip to the bill, so with hearts racing and hopes soaring we picked up our scopes and gear and ran over to get a better look at the bird. With closer views the red tipped bill was visible, clinching the identification as a Black-tailed Gull (Larus crassirostris), almost certainly the Black-tailed Gull that had apparently been wandering around Lake Michigan for the past few months. After taking a few dozen photos* I made a mental description of the bird: about the same size as a Ring-billed Gull, slaty-gray mantle similar in color to a graellsii Lesser Black-backed Gull (Larus fuscus), yellow legs, yellow bill with a black subterminal band and red tip, and black tail band. Within minutes other birders started to arrive including Montrose regulars Kanae Hirabayashi and John Purcell. I decided that I had enough photos of the bird so I sped home to get word out of the Asian vagrant that was at Montrose Beach. Luckily, the Black-tailed Gull spent several hours at Montrose and, unlike the earlier sightings in Wisconsin and Indiana, was seen by a number of birders. The bird also made the Channel 7 evening news, the Chicago Tribune, and the MSNBC Web site. Note: A Black-tailed Gull was seen at Lake Carlyle in January 2016. This is the second accepted record of this species for Illinois. *I used a Questar telescope and a Fujifilm A303 digital camera to photograph this bird, a technique called digiscoping. To read about how I digiscope, see the Digiscoping with a Questar page.